Rate - N/$ Home eCurrency PayMyBill	Forex	Useful Links	Login Join for FREE! 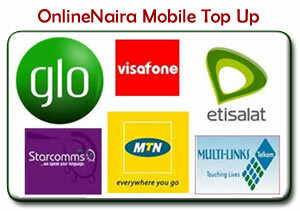 Recharge your Moile Phone with OnlineNaira. OnlineNaira has partnered with every mobile phone operator in Nigeria to provide you with an online mobile phone recharge that is fast, easy to use and probably the most reliable. Most recharges have been completed within 5 mins and we aim to make it even quicker. Why not try it now? You do not need to be a CERTIFIED member of OnlineNaira, but you will need to have enough money in your OnlineNaira account in order to do a mobile phone recharge. If you are not already a member of OnlineNaira, SIGN UP here now! Login and click on SEND MONEY. Choose Mobile Phone Recharge from the list. Choose amount of recharge you want and submit. On the next page, enter the mobile phone number you want us to recharge for you. Enter the Mobile Phone Network. Your phone is recharged within 5 mins. 1. Sell phone recharge to visitors on your website. To start, copy the code below and paste to your website. You would also need to add your OnlineNaira Username so that your Commissions are paid accordingly. 2. Sell phone recharge to people by processing it yourself in OnlineNaira. This would be th eiption if you do not have a website to place the code abouve. You would be required to login into create a separate account for phone topup in OnlineNaira so that all commission due could be remitted in good time. You will receive NGN 25 every time someone recharges through you or your website. this money is paid on a daily basis if you do a lot of recharging, but it may be done weekly to allow your commissions to accrue for lower number of recharges. Everyone who signs up for OnlineNaira membership while recharging their phone is automatically added to your downline. This means that you receive 5% of every profit we make from all their transactions. You get this commission instantly. We do not compete on price, but our fees will always reflect the costs of providing Mobile Phone Recharge Services to you. Please do not hesitate to contact us if you need further details in respect of the fees we charge here at OnlineNaira - info@onlinenaira.com.